The parish of West Dereham is situated in southwest Norfolk, to the east of Ryston and Crimplesham. Dereham probably comes from the Old English for ‘enclosure for deer’. The parish has a long history, and was certainly well established by the time of the Norman Conquest, its population, land ownership and productive resources being extensively detailed in the Domesday Book of 1086. The earliest evidence of human activity comes in the form of a rather worn Palaeolithic flint handaxe (NHER 13405) found in Anzac Gravel Pit in 1976. There are currently no Mesolithic finds, but Neolithic objects recovered include polished flint axeheads (NHER 2450, 11986, 14577, 14578 and 14579), pottery fragments (NHER 4390), a stone axehead (NHER 14578), a flaked flint axehead (NHER 31047) and a flint laurel leaf. A stone axe hammer (NHER 4388) found to the east of the village in 1957 may be Neolithic or Bronze Age. Bronze Age objects recovered to date include two copper alloy axeheads (NHER 2511 and 18447), a palstave and shield ornament (NHER 2512), a spearhead (NHER 1070), pottery fragments (NHER 4390), a pin (NHER 4393) and two barbed and tanged flint arrowheads (NHER 4389 and 11986). Aerial photography has identified several ring ditches (NHER 16162, 16163, 18825 and 50566), which may be the flattened remains of Bronze Age round barrows. Iron Age finds include pottery fragments (NHER 1070, 4390, 4392 and 18423), a brooch (NHER 4390), a coin (NHER 4004) and a gold coin (NHER 1070). There is plentiful evidence of Roman activity. Excavation, observation and metal detecting in Anzac Gravel Pit since 1969 have revealed evidence of a Roman building and kiln (NHER 4390). 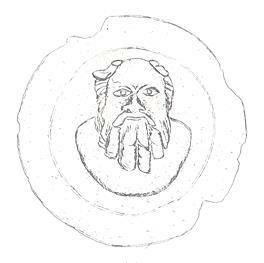 Many Roman finds have also been recovered, including coins, metalwork, pottery and tile fragments and a fine copper alloy mount depicting the head of Silenus, the companion of Bacchus (NHER 4390). In the north of the parish, aerial photography shows the cropmarks of a square enclosure and other smaller enclosures, ditches and a trackway (NHER 4393). The large quantity of Roman finds recovered from the area since the 1950s, including coins and pottery fragments, indicate that the features observed from the air are Roman in date. Roman pottery, tile and brick fragments found in 1882 indicate the former presence of a salt works (NHER 4394). Quite a number of Roman objects have been recovered from elsewhere in the parish, selected examples including pottery fragments (NHER 1070, 2513, 4392 and 23731), coins (NHER 22633, 22912 and 31151), brooches (NHER 28340, 31151, 4004 and 44106) and a spur (NHER 50192). A large gold finger ring (NHER 14521) found in 1965 could be Roman or Saxon in date. Saxon finds include pottery fragments (NHER 1070, 12504, 17433 and 17434), a buckle and brooch (NHER 1070), a harness mount and strap end (NHER 22912) and coins (NHER 31151 and 4004). Metal detecting in 2002 recovered a rare Late Saxon or Viking period gold ingot (NHER 37525). It was declared Treasure in 2003 and purchased by Norwich Castle Museum. The medieval period has left the parish with its oldest surviving building, St Andrew’s Church (NHER 4425). The earliest part of this building is its big round carstone west tower, which is Late Saxon or Early Norman in date. The tower is of exceptional diameter, has walls that are 1.2m thick and is the largest example of its type in Norfolk. The octagonal belfry stage on top is 14th century and has six bells, though these are no longer rung. The 15th century south porch houses a 13th century south door, the north door, now blocked, being of a similar date. The porch was probably rebuilt in the 17th century, when the shaped gable was added. The remainder of the church is mainly 15th century. The chancel was restored in 1895 and a few years later the nave roof collapsed and had to be replaced. Inside is a simple 14th century octagonal font and an early 17th century pulpit and reading desk. On the north nave wall is an alabaster monument to Robert Dereham (who died in 1612) and his father (who died in 1559) and next to this a very decorative panel to Sir Thomas Dereham (who died in 1722). Best of all, standing opposite, is a finely carved life-size marble figure of Colonel the Hon. Edmund Soame (who died in battle in 1706), wearing armour and striking a suitably martial pose, one of the best standing monuments in Norfolk. The memorial was commissioned by Edmund's sister, who also provided the fine set of three-sided communion rails. Original 15th century stained glass survives in fragmentary form in the east window and one south nave window. The churchyard has plenty of interesting 18th century headstones. Other medieval ecclesiastical buildings have not survived. St Peter’s (NHER 4423), another medieval church, once stood within the same grounds as St Andrew’s, but no trace of it remains today. East of West Dereham is the site of St Mary’s Abbey (NHER 4396), founded in 1188 by Hubert Walter, Dean of York, as a daughter house of Welbeck Abbey, for canons of the Premonstratensian order. It sits within a monastic precinct surrounded by a moat and was among the larger religious houses in Norfolk, with up to twenty six canons in the late 13th century, and was also quite wealthy, with extensive estates. Following the Dissolution in 1539, the site and associated lands were granted by Henry VIII to Thomas Dereham of Crimplesham. A house built on the site in the later 16th century was altered and extended in the 1690s by Sir Thomas Dereham on his return from Italy, where he had been envoy to the court of the Grand Duke of Tuscany. This house was largely demolished in around 1810, the remaining part being converted to a farmhouse, the ruins of which were restored in the 1990s. Almost all the abbey buildings have been demolished, but buried foundations survive and can be seen as cropmarks on aerial photographs, as can other earthworks and fishponds. At Grange Farm is an area (NHER 4422) that was the principal local grange to St Mary's Abbey (NHER 4396), the grange being replaced in the 17th century by a mansion, the remains of which were demolished in 1947. Within the area is a square moated feature surrounded by large banks and with a small central island. The feature is classified as a medieval moat, but it has also been suggested that it was an integral part of a 17th century garden landscape. Large quantities of medieval roof tile fragments, three bricks and a piece of pottery were collected from the surface in 2003, together with many post medieval pottery fragments and a brick. Perhaps the feature started out as a medieval moat and was re-landscaped in the 17th century as part of a garden layout. Numerous medieval objects have been recovered, selected examples including buckles (NHER 1070, 4393 and 12504), coins (NHER 15832, 22634, 22912 and 30807), seal matrices (NHER 31151 and 44096), a very nice sword belt chape (NHER 28340), a horse harness pendant and a brooch (NHER 4004). Of the post medieval buildings to survive, probably the earliest are White House Farm Barns (NHER 32759), two high quality 16th or 17th century brick barns, incorporating much re-used medieval material, altered and extended in the 18th century. They were in ruins in 1997 but are now thought to have been converted to residential use. To the north is White House Farmhouse (NHER 41156), a flint house of one storey and attic, dated 1698; it was extended to the north soon afterwards, with re-used medieval stonework. The upper floor was added at two periods in the 19th century. The interior is almost all 20th century. College Farmhouse (NHER 12533) on Basil Road is an early 17th century timber framed house, one storey high with dormer attics, sandwiched between carrstone and flint gable walls added in 1626, the north gable having this date on it. The windows are 20th century replacements. The gault brick two storey west extension dates to 1900. Restoration work in the late 1990s revealed inglenook fireplaces and other original features. West of Church Road is White Hall (NHER 18876). This house appears to be a normal two storey three bay Georgian building with a central round-headed doorway. However, it began life as a single storey thatched dwelling of flint, brick and re-used medieval stone from St Mary's Abbey (NHER 4396). A major transformation took place in about 1780, when the upper floor and north wing were added, the interior layout completely changed and a new façade made (it was once rendered). The scale of the reconstruction suggests that it was for a person of considerable means. South of Lime Kiln Road are the remains of a square lime kiln (NHER 12517). The bell of the kiln has collapsed in front, but is complete on three sides, with tap holes. Other post medieval buildings, including a windmill (NHER 14522), a 19th century engine shed (NHER 2554) and a drainage pump (NHER 2555) have now gone. On Ryston Road is the site of a 17th century and later house (NHER 12534), built with much re-used medieval stone, probably from the abbey (NHER 4396). The house was demolished in 1997 and new houses built on the site. Some of the material from the old building has been incorporated into structures in the grounds of White House Farm (NHER 41156). The most historically recent entry on the record is the site of a World War Two searchlight and anti-aircraft gun emplacement (NHER 12518), in use between 1939 and 1945. The buildings have now gone, but their foundations can still sometimes be seen as cropmarks. P. Aldridge (NLA), 20 September 2007.